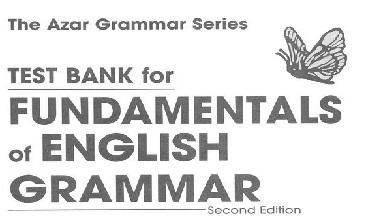 "Test Bank for Fundamentals of English Grammar" is a 193 pages book, written by M. Lynn Morgan Mark and published by ﻿The Azar Grammar Series. The book focuses on various aspects of English Grammar. The book covers various topics on Preset Time, Past Time, Future Time, Nouns and Pronouns, Modal Auxiliaries, Asking Questions, The Present Perfect and Past Perfect, Count/Noncount Nouns and Articles, Connecting Ideas, Gerunds and Infinitives, Passive Sentences, Adjective Clauses, Comparisons, Noun Clauses, Quoted Speech and Reported Speech, Using Wish; Using If. Apart from these chapters, the book also contains MID TERM Tests which will enable you to make self assessments. This ebook will be very useful for students who are preparing for bank tests and other competitive exams, where Test of English Language is an exam topic. All the time I used to study article in news papers but now as I am a user of web so from now I am using net for articles or reviews, thanks to web.